In New Orleans, Getting Back to Business Just as tens of thousands of people lost everything to Katrina, so, too, some will make a quick fortune off its aftermath. But there are also stirrings of the honest enterprise that will be so necessary to bring New Orleans back to life. New Orleans today is a city of deprivation and, believe it or not, opportunity. By now we are only too familiar with the deprivation, the ruined, toppled homes, the St. Gabriel morgue filled with the dead, and the families uprooted and tossed by the wind to some strange city. But on the debris-lined streets of this city are also signs of enterprise. Some are literally signs, right there along the street, signs from car dealers open for business and signs for an 800 number if you want to join a Katrina class action suit. Then there are signs from people who will gut your home, buy your home, or rid it of mold. Or at least that's what they're promising. Some of this has the scent of heartless opportunism, sharks swarming around desperate people who are in no position to sort out their options. Just as tens of thousands of people lost everything to Katrina, so, too, some will make a quick fortune off its aftermath. But there are also stirrings of the honest enterprise that will be so necessary to bring the city back to life -- businesses hunkering down for the tremendous task at hand. With the middle-class Uptown neighborhood still uninhabited, employees from the Winn-Dixie chain worked around the clock drying out the market on Tchoupitoulas Street and restocking shelves. When the store re-opened last week -– perhaps the first supermarket in the city to do so -- returning residents in the neighborhood were thankful. Some of them hugged clerks and shared evacuation stories. You could see customer loyalty developing before your eyes. Not far away, the historic 1,500 acre City Park has been battered. But opportunity exists there, too. The park has been transformed into what might be the largest assemblage of dump trucks anywhere. Hundreds are lined up waiting for inspection with crews ready to haul away trash from around the city. It's a monumental job. One driver I met had just quit his job in Alabama as a carpenter. He'd left behind his wife and two kids in Mobile for the promise of better pay. He said he's willing to stay until the job is done. The city predicts that will be at least a year. In the French Quarter, restaurants are stirring back to life. Because of the trying circumstances, many places are offering only the most basic menu -– in New Orleans that means gumbo. Also burgers and chicken. But on Decatur Street, chef Philip Chan is turning out sophisticated and complicated Asian Cajun dishes: shrimp with Louisiana spices served in a bird's nest made from crispy wonton, pan seared snapper served with crawfish and crabmeat. Except for the plastic forks and knives, once you set foot in Chan's restaurant, you forget that this great food city has been devastated by a hurricane. One afternoon I met Chan on Canal Street, just outside the French Quarter. He had a pile of photocopied menus and was handing them out at hotels. Chan moved to New Orleans nine months ago from Atlanta, where he has a highly regarded Chinese restaurant. You might expect him to be rueful, or even depressed, by his decision to start anew in the Crescent City. But he's running, with menus under his arm, chasing opportunity. 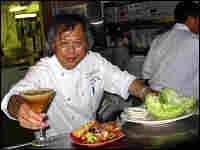 I told Chef Philip Chan I had a question: how long will you stay in New Orleans? He first looked at me as if I'd asked him something very peculiar. Then he answered: "Forever," he said. Uri Berliner, NPR's business editor, has been editing stories from New Orleans for the past week.